Not quite teenagers, but definitely not little kids anymore, 10 year old boys are sometimes the hardest age group to find gifts for. They need things that are interesting and challenging, but they can’t quite cope with the complexity of many of the toys and games designed for older children. In order to help you find presents for this ‘in-between’ age group, we’ve compiled a massive list of some of the best gifts for boys aged ten. There really is something for everyone here, from electronics top board games, puzzles and science kits, so no matter what your son is like, we’re sure you’ll find a great gift for him here. As any parents with children of this age will know, boys will need something that is going to hold their attention, as they will get bored of toys made for younger kids very easily. So you should look for gifts that will really engage them and let them use their imagination. However, they are still children, so you need to make sure that it is not too complicated. A good gift for an older boy might be a cool RC car. At this age, they are also getting ready to go to high school in a few years, so you can get them something educational too. Perhaps a science kit might inspire them to take up chemistry, or maybe you can get them a cool electronics set? One of the great things about buying for this age group is that they usually have developed their interests and hobbies, so if you can find something that ties into them, it will probably be the best gift you can buy. An accessory for his favorite sport? A new Nerf gun? A book on his favorite subject? Many boys of this age are also very social, so you can also get him something that he can play with his friends, such as a board game or a set of fighting robots. Some boys around 10 have everything and it can be a challenge to find them something that will keep their attention and interest. That’s why we have put together a huge list of 39 different types of toys for boys, so that you will be able to find something unusual. From unique toys to outdoor gift ideas there is something in this review for everyone. Drones for kids have taken the world by storm in recent years, and they really do seem to be the coolest toys for boys these days. 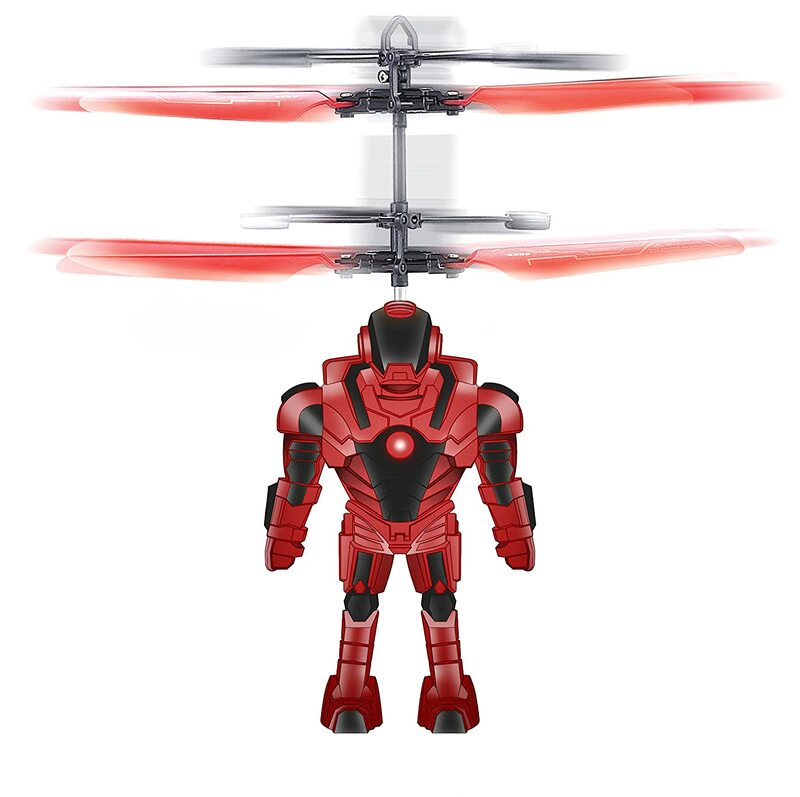 This awesome mini drone will be a great present for a 10 year old boy who loves remote control toys and robots. The cool thing about this flyer is that is doesn’t actually need a remote controller to fly. The simply hold their hands under it and it will hover around with them. Its automated sensors will keep it steady and stable. This cute little robot comes with a USB charger and has built in batteries, so everything your little lad needs comes in the box. This will be a great first drone for a boy aged 10. 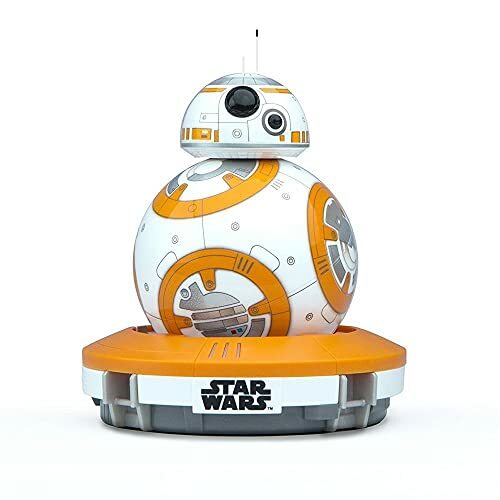 Star Wars just never seems to grow old, and with BB8 winning over the hearts of a new generation of kids in the latest films, this cool remote control BB8 droid might be the ideal for a boy who loves Star Wars. This cute little Star Wars robot fits in the palm of your hand, and it has a tough and waterproof polycarbonate shell. You’ll need to download the iOS or Android app in order to control it. Your son will get around 60 minutes of use on a full battery charge and it has a 30 meter blue tooth range for controls, giving him and BB8 plenty of time to have some crazy adventures. Best of all, this Sphero BB8 can actually respond to your kids voice commands and emotions! So its more of a robot companion than a toy. Cycling never seems to go out of style, and cool BMX bikes are some of the best options around for adventurous boys, whether they are used off road or as street bikes. This awesome bike is not only cool and very stylish in its red and black paint job, but it is also very well made and durable, making it a great pick for a boy who loves cycling, exploring and nature. When buying a bike for your son, safety is going to be your number one concern. 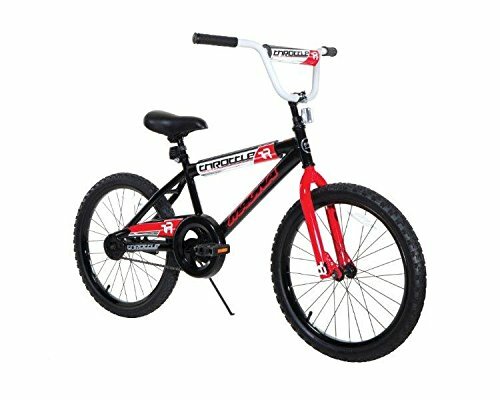 You’ll be pleased to know that this BMX bikes for kids have a tough steel frame and coaster brakes for easy braking, so your little man will be in good hands with this. Just make sure he wears a helmet and pads as well. Ever since Bear Grylls wandered onto our screens in his epic TV show Man Vs Wild, rugged and adventurous boys all across the world have been interested in survival. In this cool book, which is available in both paperback and kindle editions, they can learn all about some crazy survival techniques for real world and fictional events, from being trapped in the desert to coping with a Zombie invasion! We really love how this book balances out real world knowledge and humor, with sections on how to survive and avalanche as well as a shopping trip with their mum. This will be a great book for boys who like the outdoors and have a good sense of humor. In times like these, we need to educate our children about taking care of the environment and being responsible with our waste. 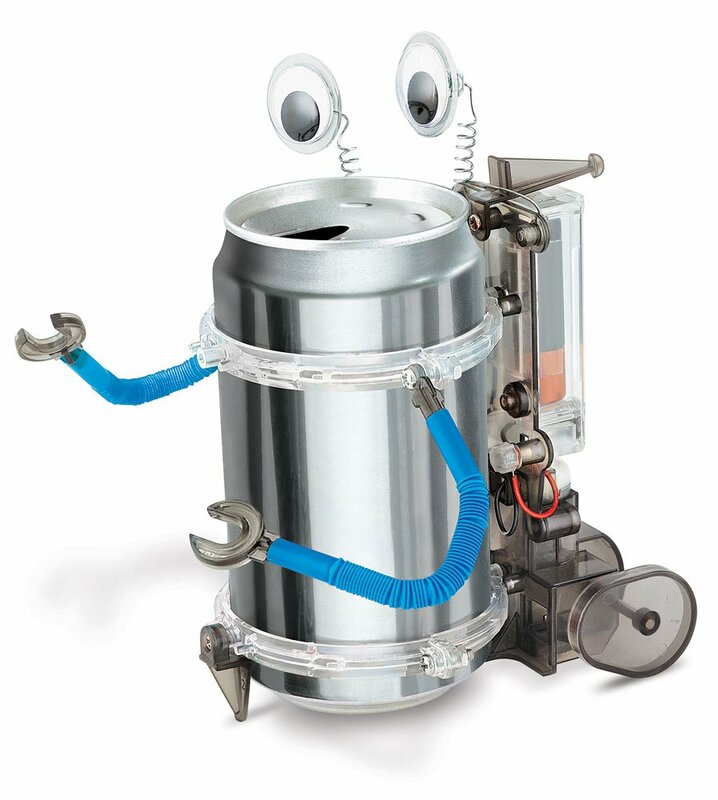 Recycling is a major part of this, so we can introduce them to this concept with this fun robot building kit that uses an empty soda can as the robots body. Although they’ll need to be supervised by an adult, your kids will be able to tackle this simple kit head on as, and parents can rest easy as no special or technical knowledge is required – the instructions say it all. This is a wonderful present for a boy who loves science and cares for the environment. if you’ve got a boy aged 10 who loves science, engineering, and robots than this cool robot arm will be an excellent gift for him. 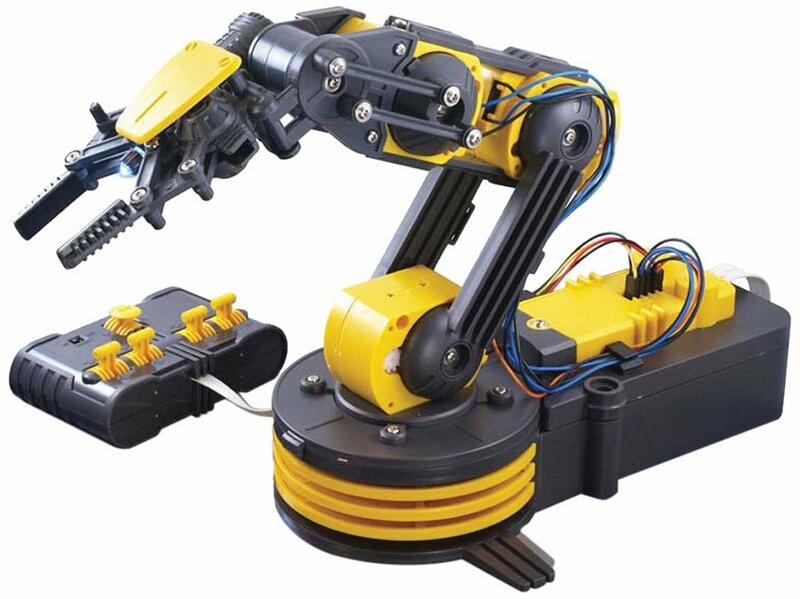 He can command the gripper to open and close, wrist motion of 120 degrees, an extensive elbow range of 300 degrees, base rotation of 270 degrees, base motion of 180 degrees, vertical reach of 15 inches, horizontal reach of 12.6 inches, and lifting capacity of 100g! That’s some serious power in this toy. It also has a search lift on the gripper and safety gears built in to ensure that no harm comes to your child. This toy will give them hours of enjoyment, as they first have to assemble it, then they can use it. This is a great STEM gift and something that little inventors and mad scientists will absolutely love. If there are two things that most 10 year old boys love, its gonna be Star Wars and Lego, so a Lego Star Wars set is going to be an amazing gift for most children in this age group. 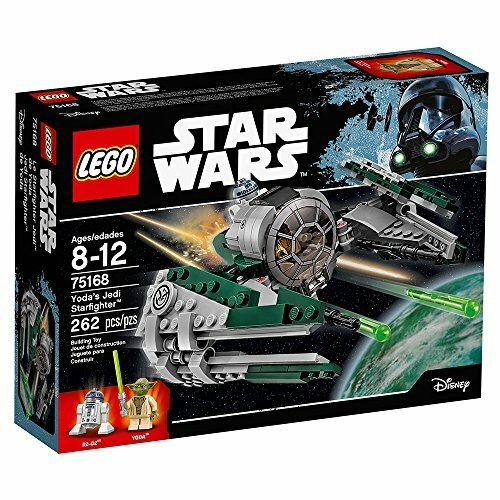 This particular set comes with a spaceship with folding wings, front-and-top-opening mini figure cockpit, space for R2-D2 behind, and two laser cannons and spring-loaded shooters. So they will have lots of fun both building it and playing with it. The cool thing about these Lego Star Wars sets is that they are both educational and fun to use, and your kids can always break them down and make their own crazy inventions. Everything you can think of from robots to food science and all kinds of stuff is covered, with lots of illustrations and brilliant photos to make this a really exciting read. Best of all, it’s like a sneaky lesson for your kid, as they enjoy the book so much they won’t realize how much they are learning. Sometimes it’s best to just give children something they can have their own fun with if your kid has an interest in exploring, nature, bird watching or the outdoors, this cool set of kids binoculars will be great for him. 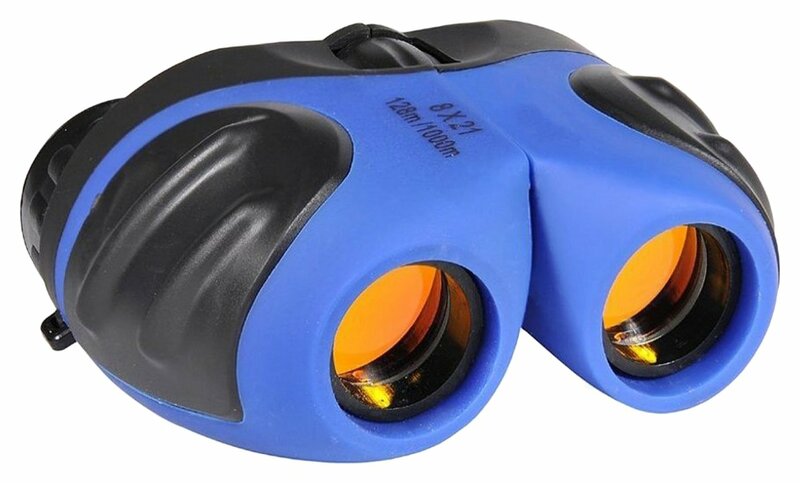 These binoculars have been specially designed for children. They have special grips, easy focuses and soft eye pieces to make them safe for younger ones. Best of all, they are shock proof and built to withstand falls, just in case they get dropped. They also come in a range of different colors, so you can find one in his favorite red or blue, if you want to. 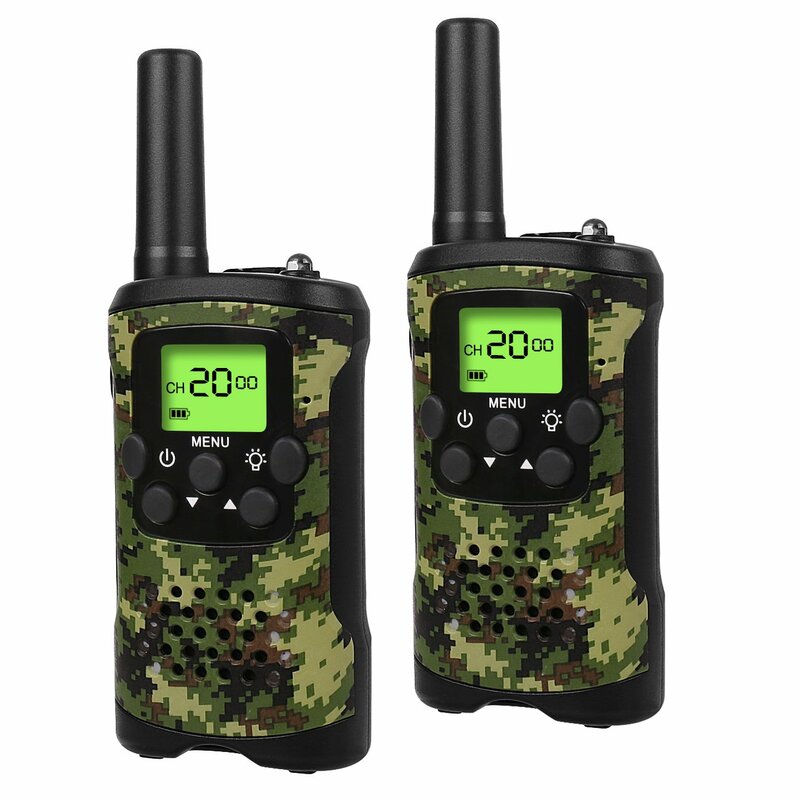 Whether its for playing pranks on family members or exploring the great outdoors with their friends, walkie talkies are some of the best toys for 10 year old boys as they allow them to have so much fun and use them with their friends and siblings and integrate them into the games they are playing. There are some great boys walkie talkies out there, and this set is our favorite. Not only do these 2 way radios for kids look very stylish, they have an impressive 3 mile range and 22 channels, giving almost endless possibilities to your son and his friends when playing with them. They are small and compact too and have great sound quality. Batteries not included. 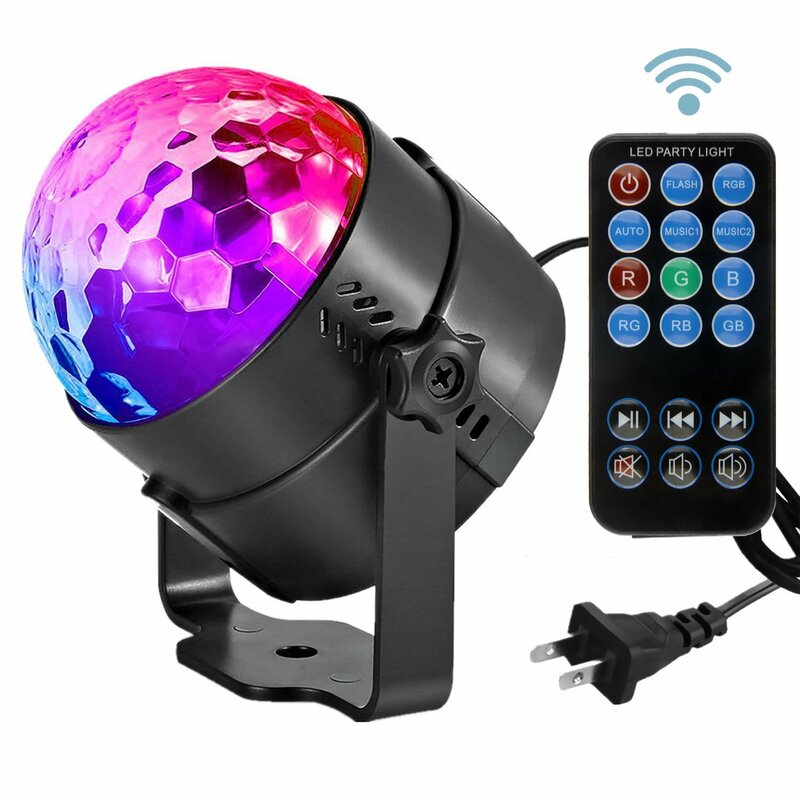 If you’re looking for a present for a boy who loves music and dancing, this cool party light might be an ideal gift for him. This has 7 different colors and many different modes and effects, all of which can be triggered by remote control. Its also very easy to use – all you need to do is plug it and of it goes. This will also be an amazing gift for a 10-year-old who plays music in a band, or maybe a kid that has their own games room in the loft or basement where they can set it up without disturbing the rest of the family. It will also be great or birthday parties and special events. 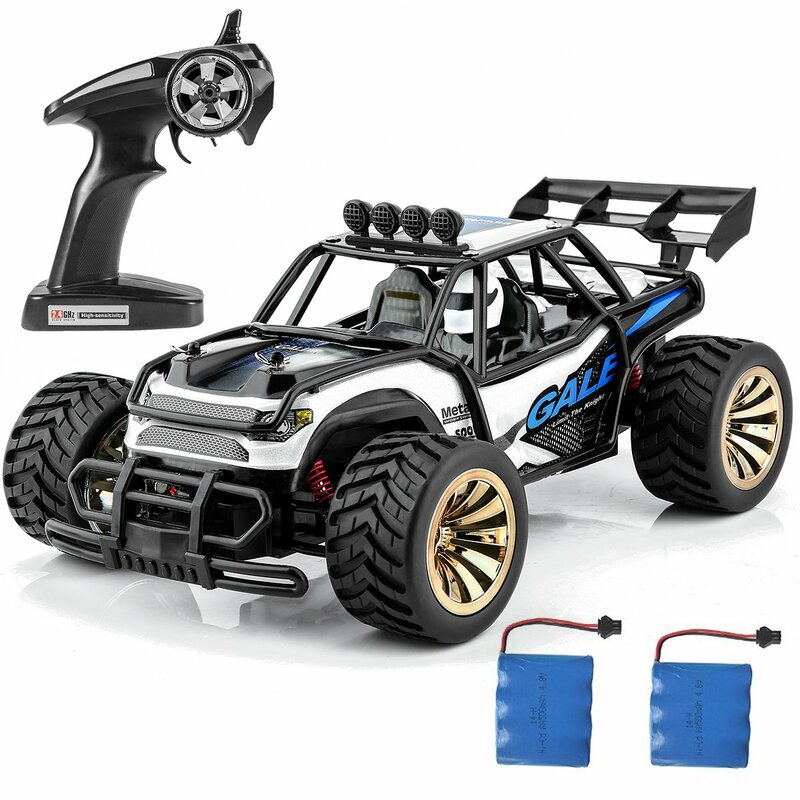 There’s nothing cooler than remote control cars, but for a 10 year old boy, you might need something with a bit of power. Why not try this amazing monster truck toys then, if your child is into RC cars? This cool desert buggy is made on a 1/16 Scale, and it can go up to 10 miles per hour. It’s big wheels and robust design make it perfect for driving on the street or off-road, and with its 2.4GHz transmitter, you won’t get any radio interference. The only thing you’ll need to buy extra is 3 AAA batteries for the transmitter, and this comes with a USB charger for the car. This will be a great gift for energetic kids who lov driving and trucks. 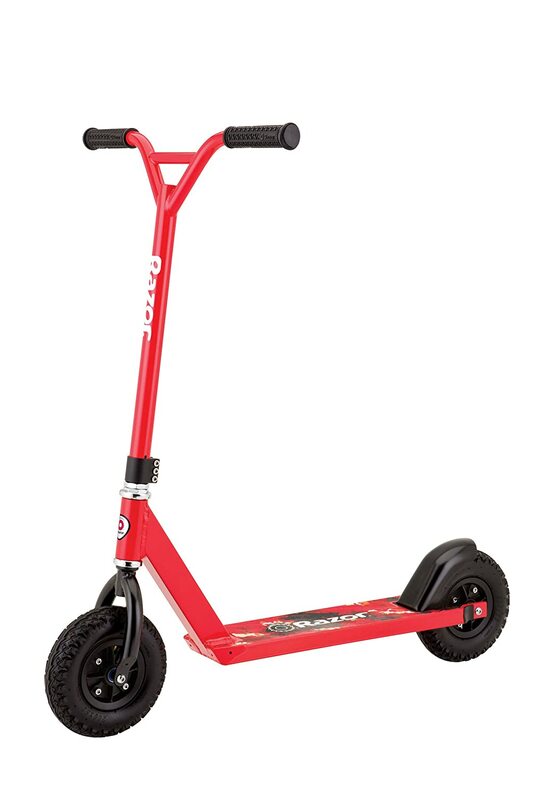 Riding a scooter should be a right of passage for every young boy, and with this cool Razor Dirt Scooter, your son will look stylish and stay safe wherever he rides it. What’s really amazing about this scooter is how it can handle both the street and off road with ease. It has 200mm pneumatic tires with aggressive treads and a heavy duty aluminum frame, making it strong, durable and ready for anything that man or nature can throw at it. It also looks very sweet in its stylish racer red color. This might be the best scooter for boys we’ve seen. At 10 your son or grandson is definitely at an age where he will be inquisitive and interested in learning about the world around him. Growing crystal kits are classic science toys and every kid should have a chance to play on, as they are educational and lots of fun. This one from National Geographic might be the best one we’ve seen in a while. 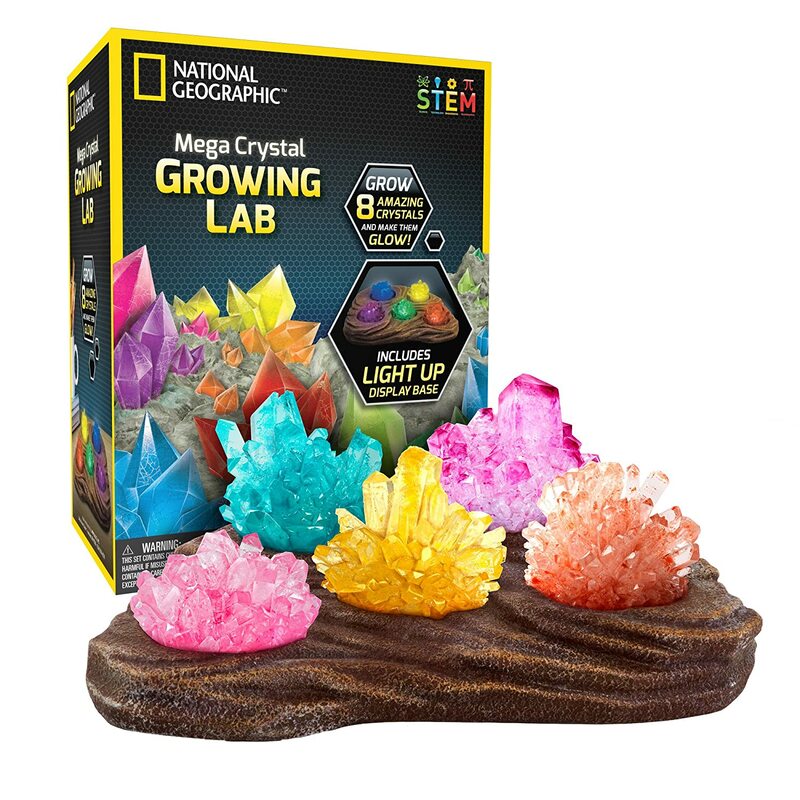 Following the easy to understand instructions, your son can grow crystals in all kinds of colors and shapes, and this kit can even double up as a nightlight. Best of all, it has an informative STEM book included that teaches your kids all about crystal formation. This will be an amazing gift for a ten years old boy who loves science and learning about the world. 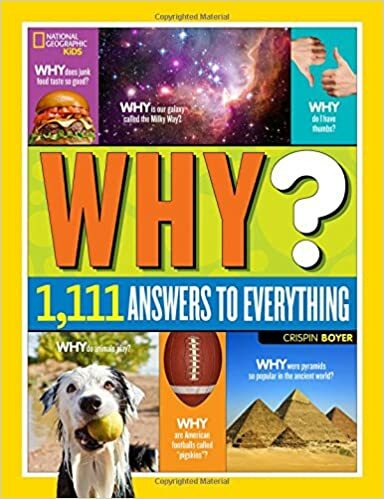 As every parent knows, boys are crazy little bundles of curiosity, so this cool Nat Geo Kids book will be just amazing for an inquisitive kid. With questions on everything from why gravity works to why our blood is red and our snot green, these light-heated topics have real science and learning within, helping your kids get more knowledge on science, history and more. 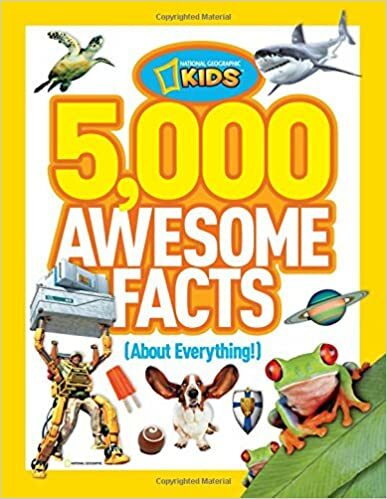 Parents probably don’t know half of these things either, so its a great book to read with your little lad. .
We all know how much little boys love shooting things, but a 10 year old might not be mature enough for a real archery set yet. So why not give him this cool toy boy and arrow set? This faux bow will feel just like the real thing to your lad, but it has the advantage of being specially designed for kids and having safe, lightweight arrows. These arrows have foam tips, so you don’t have to worry about them causing any damage. 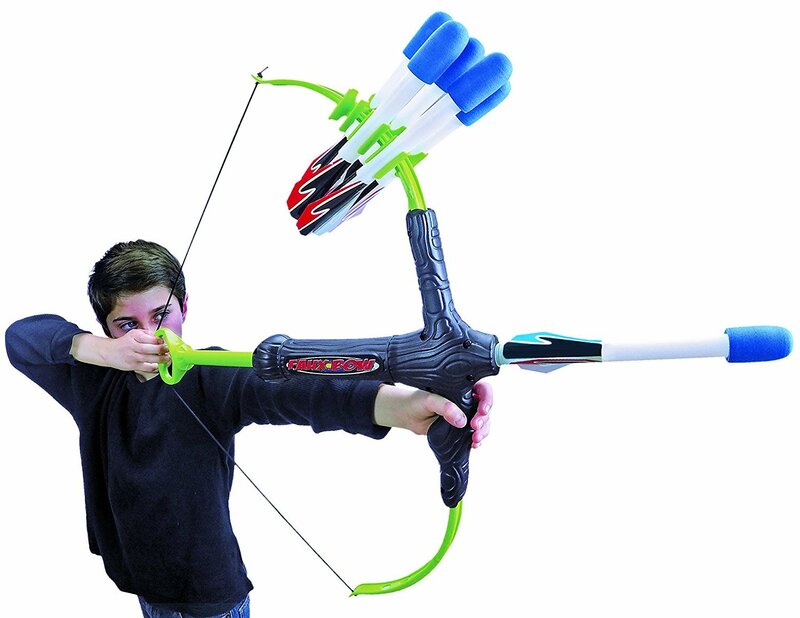 This will be a great alternative to a Nerf Bow and a wonderful gift for a ten years old boys who love shooting things. Somewhere between soccer and air hockey is where we find the new craze that is hover ball. 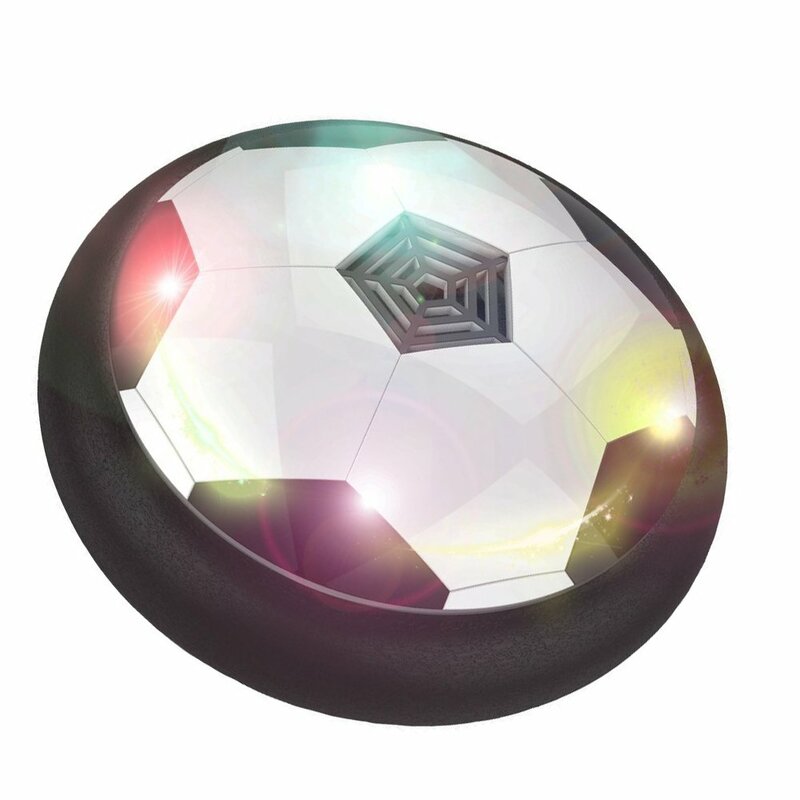 Using a flat, floating ball for indoor soccer matches, kids just can;t get enough of it. IF you’ve got a smooth surfaces or low-pile carpet in your home, you may just have the perfect pitch. The ball is also, very well padded so it doesn’t hurt when you kick it. Great for boys who like ball games and soccer, this is sure to become a favorite rainy day activity. No more excuses for coming home late or staying up past their bedtime with these stylish and very functional watches for boys. These have time/date, EL night-light, Stopwatch, Alarm, Hourly chime and 12/24 hour format functions, so they are very practical gifts for boys. 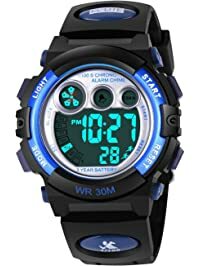 Best of all, as we know how much little lads like to get up to mischief or go on crazy adventures, these children’s watches are water-resistant to 100ft and even suitable for swimming and water sports, so it won’t break if he forgets to take it off before going to the swimming pool. 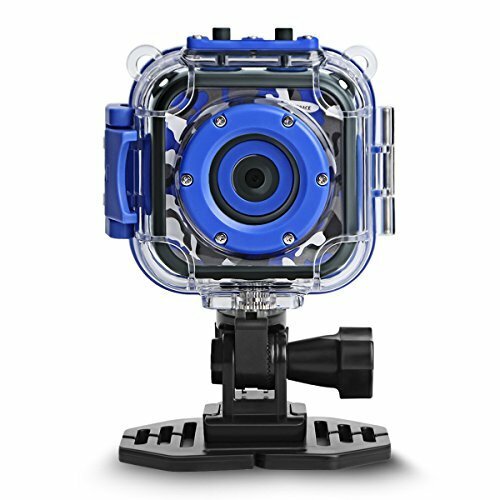 Extreme kids with a taste for extreme activities like BMX riding, skateboarding o surfing will love this action camera. Durable and waterproof, this can strap onto a helmet or bicycle and allow your little dare devil to make awesome movies of his crazy antics. I For life on the wild side, this might be the best digital camera for 10 year old who loves adventures and riding. 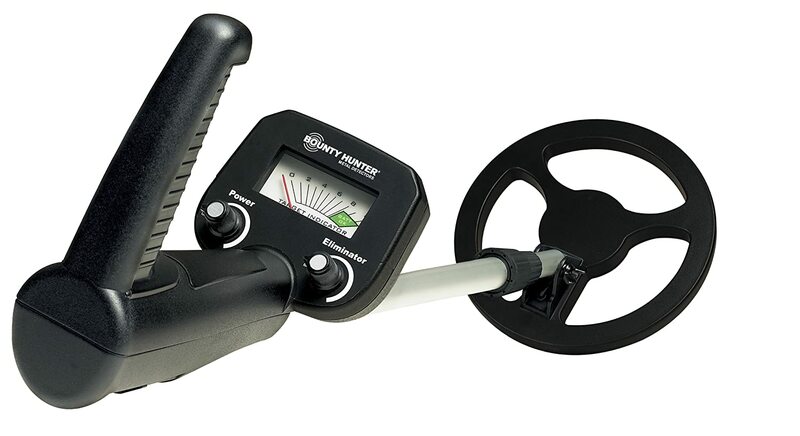 If you are lucky enough to live near the beach or the countryside, this cool metal detector might be a great gift for your ten your old. With it, he can go exploring and see what he can find. He’ll probably be able to come across a few lost coins, and who knows, he might discover something historical. This cool metal detector detects coin-sized objects up to 5 inches deep and larger objects up to 3 feet deep. It has a target indicator meter measures signal strength and the signal increases in volume as targets get closer. Discrimination control eliminates iron and most unwanted items, and its lightweight, ergonomic design makes for easy, comfortable handling. Metal detecting might seem like an odd choice of a gift, but if you want to get your 10 year old boy out of the house an in the fresh air, it might be the ideal gift. Looking for something for an outdoor loving boy? Does he like skateboarding or rollerblading? Well, if your son is up for a challenge and wants to find out about the coolest way to get around, this ripstik caster board will be great for him to try out. A variation on the classic skateboard design, speed is built up by twisting on the board, and as such, your boy will feel like he is riding the waves. Once he gets really good, there are all kinds of stunts, grinds and jumps he can learn. Just make sure to get him some good protection pads and a helmet too. Designed for children 8 years and up, supporting up to 220 pounds. These are made by Razor, an amazing company which makes all kinds of cool kids vehicles including scooters, BMXs and Dirt Bikes. All their products are very high quality and durable, and this caster board is no exception. We all know how much young boys love games that involve shooting, but trips to places like Laser Quest can get really expensive. 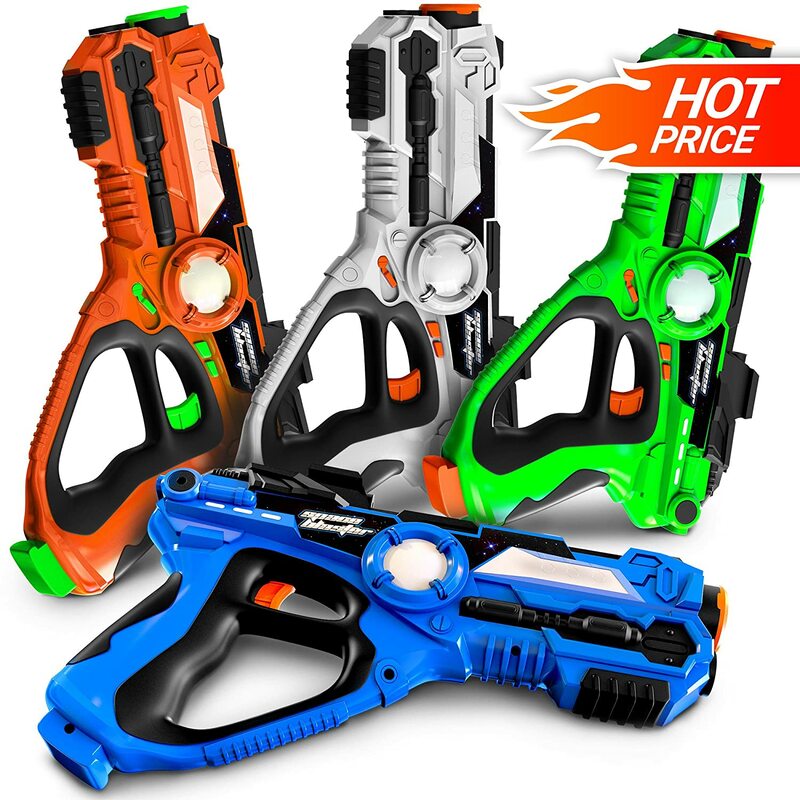 Save money and let every day be a battle day with this awesome set of 4 Laser tag guns. These laser machine gun vibrate and glow up to 130 feet, and each gun displays how many lives you have left. There’s also no need to wear vests with these guns, and the guns themselves are the sensors and pick up on when you get shot. These have been specially designed for children to use, and there is no contact between the kids when playing and the lasers are very safe. 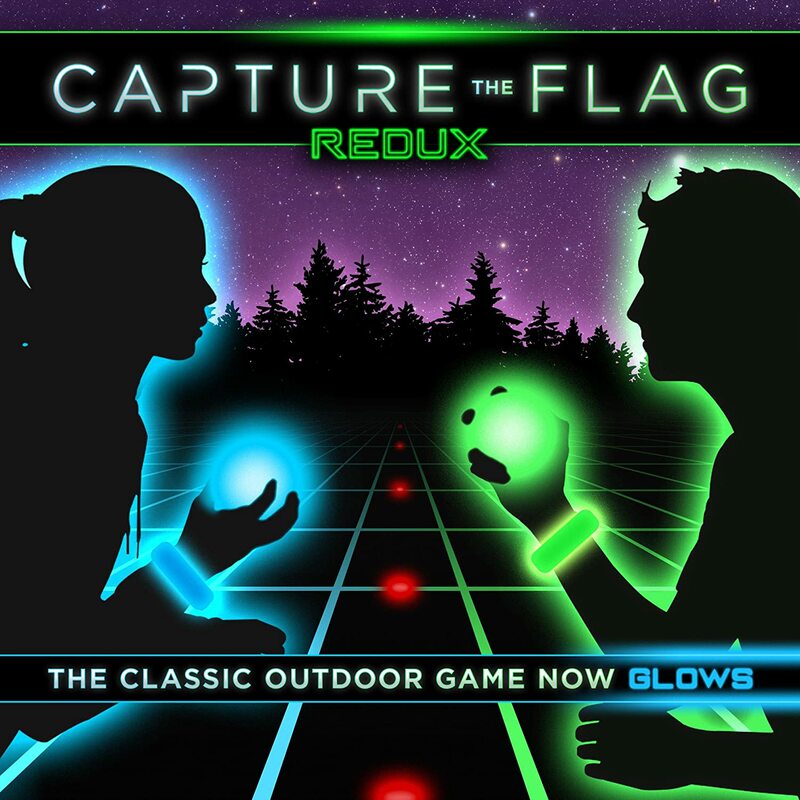 This cool game set takes the classic kids game capture the flag and turns it into an awesome nighttime activity with its 33 light up game pieces. This game is perfect for both outdoors and indoors with the lights off. And it’s a cool evening activity that will make sure your kids get exercising rather than watching the TV or playing computer games. Everything you need to play comes in the box, which includes glowing orbs (aka “flags”), 8 jail markers, 6 territory lights, 16 LED glow bracelets (8 per team), 12 game variation cards, and an illustrated instructions for different game modes. This will be great for energetic boys who love outdoor activities. There’s no excuse for not getting up on time if the Caped Crusader himself is waking you up in the morning! 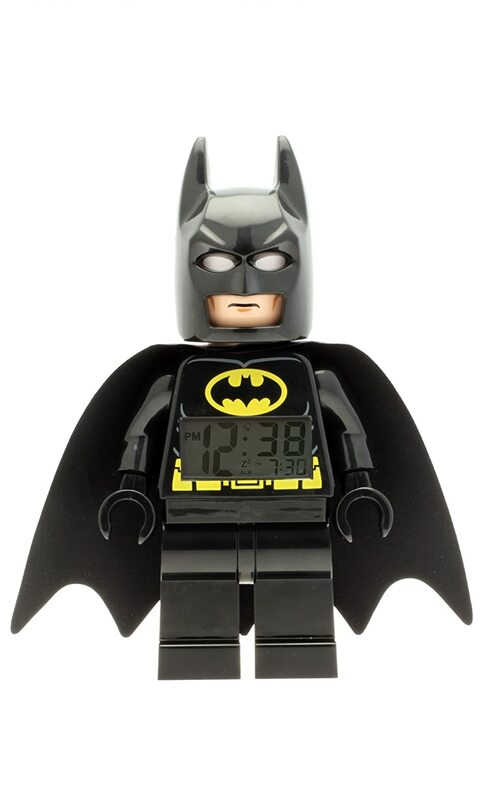 This sweet little Lego Batman Alarm Clock is a stylish and cool gift that be amazing for children who love superheroes and sleep in too often. This digital clock has an LED display which lights up and alarms and snooze functions. The only problems are that its so small could get lost easily if your son is not careful. Whether its to help out with their Geography lessons or just so they can learn more about the world, every kid should have a globe in their bedroom. Whats super cool about this one is that there are no borders or names on the globe itself; your son will have to use the iOS and Android app to find out which country is which. They can then stick the included country flags in each of the right places. But it doesn’t stop there. The app also teaches them about cultures, animals and much more for each country. 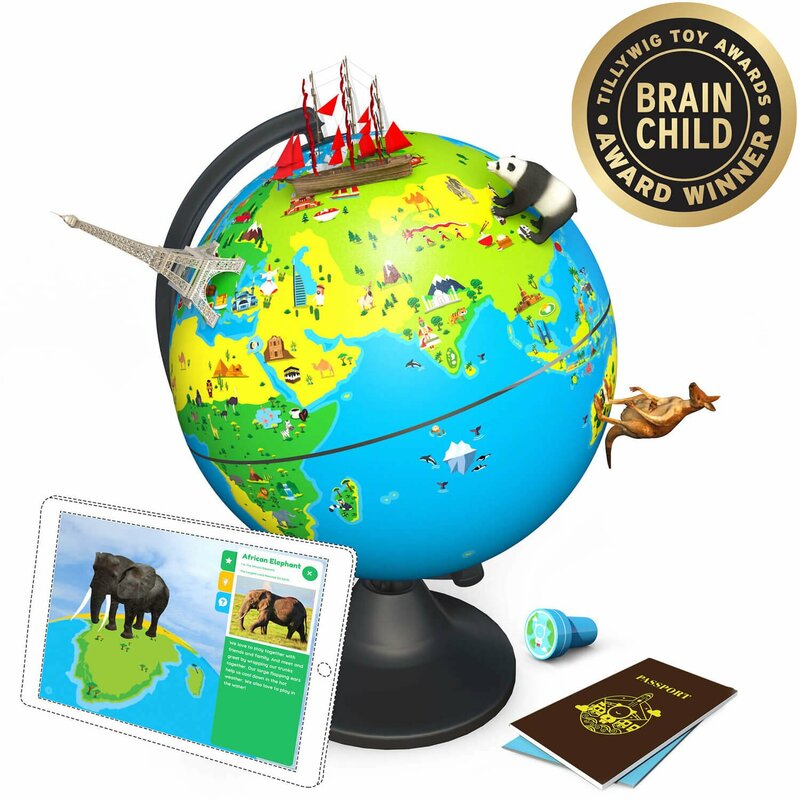 This set is a ‘Brain Child’ award winner and an excellent learning toy for young boys eager to learn more about the world. Just make sure that you have a device which can use the app, as without it your kid will miss out on most of the fun and learning. A lovely gift for a ten years old boy who loves science, this mini microscope is definitely not a toy. It is well built and designed to do some serious work for your little scientist. 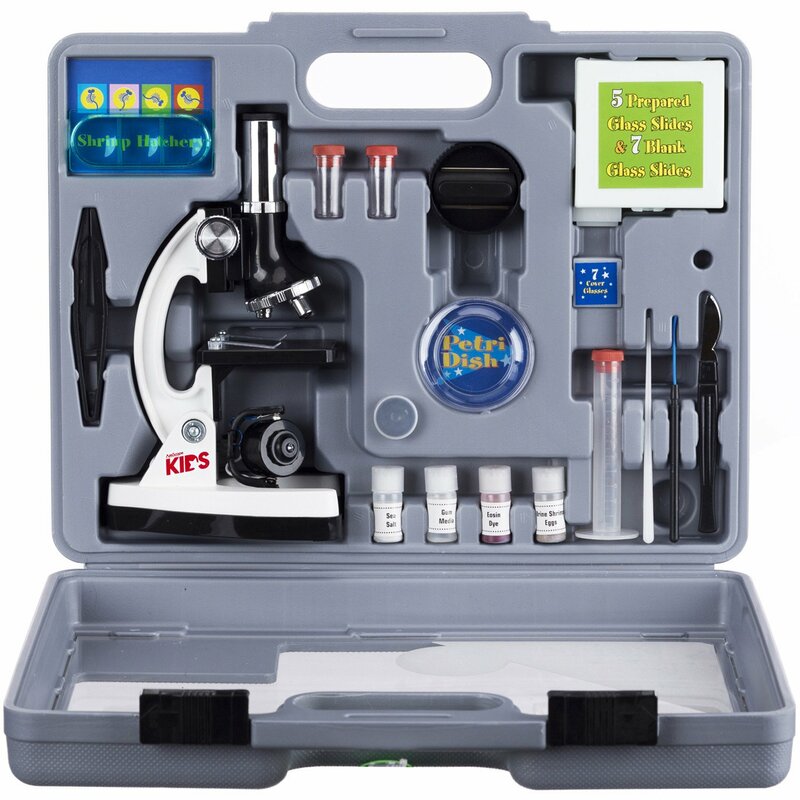 This set has a with 52-piece accessory kit and hard-sided plastic ABS case, and the microscope itself has LED and mirror illumination and built-in color filter wheel, and it can do all kinds of magnifications. A perfect present for the chemists, biologists, and physicist of tomorrow. Does your little lad love to race cars? Is he a Hot Wheels fanatic? 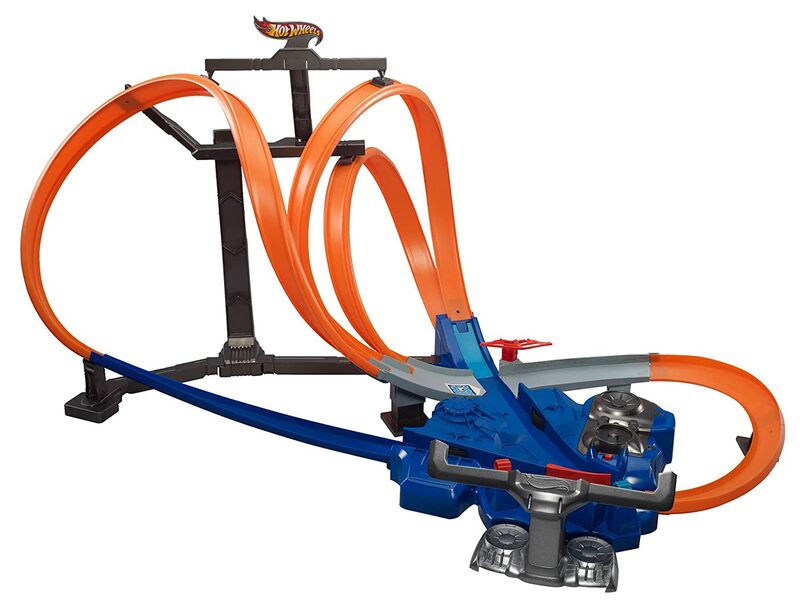 Let them experience the madness of driving their cars through a roller coaster with this awesome twister track set! They can launch one care or many through the many different loops of this great car set and will be in awe of the gravity-defying moves. Two motorized boosters control the speed the cars go at, and your child can use the diverters to create all kinds of stunts, jumps and even crashes! So he’ll be playing with this for a long time to come. One of the best things about buying presents for older kids is that they are ready for some really cool stuff that might be too much for younger ones. 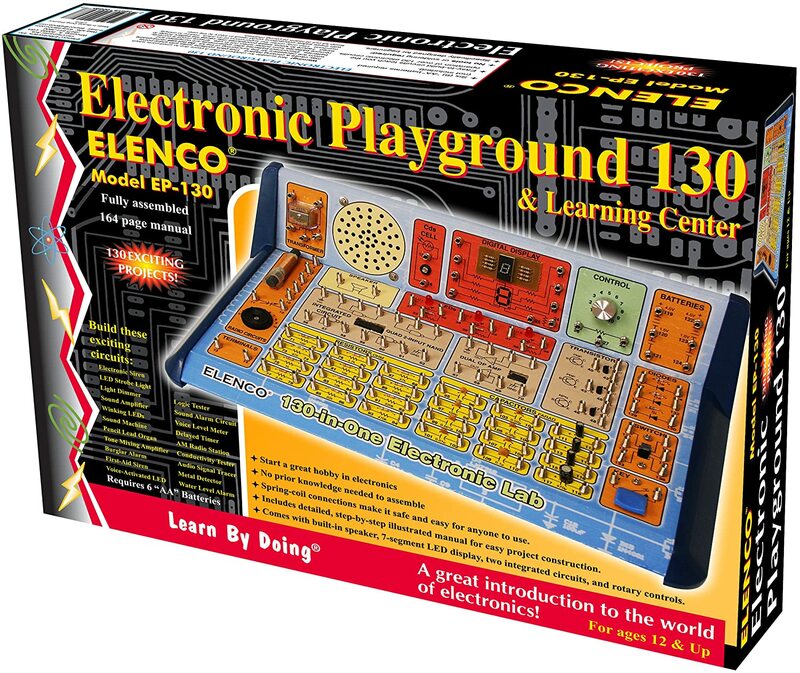 A good example of that would be this amazing and highly educational electronics kit. The is the perfect STEM gift to complement their education with over 100 experiments that teach about electricity, physics and magnets. By following the easy to understand instructions, your little mad scientist can take on projects as diverse as setting up AM broadcast stations, Electronic Organs, LED strobe lights, Timers, Logic Circuits and many many more, all the while learning a lot about electronics and circuits. This will be an incredible gift for a boy who loves learning, is interested in technology and is up for a challenge. Most boys love grimy and gruesome things, but finding something suitably icky and educational can be a bit of a challenge. Not so much with this amazing DIY science kit. 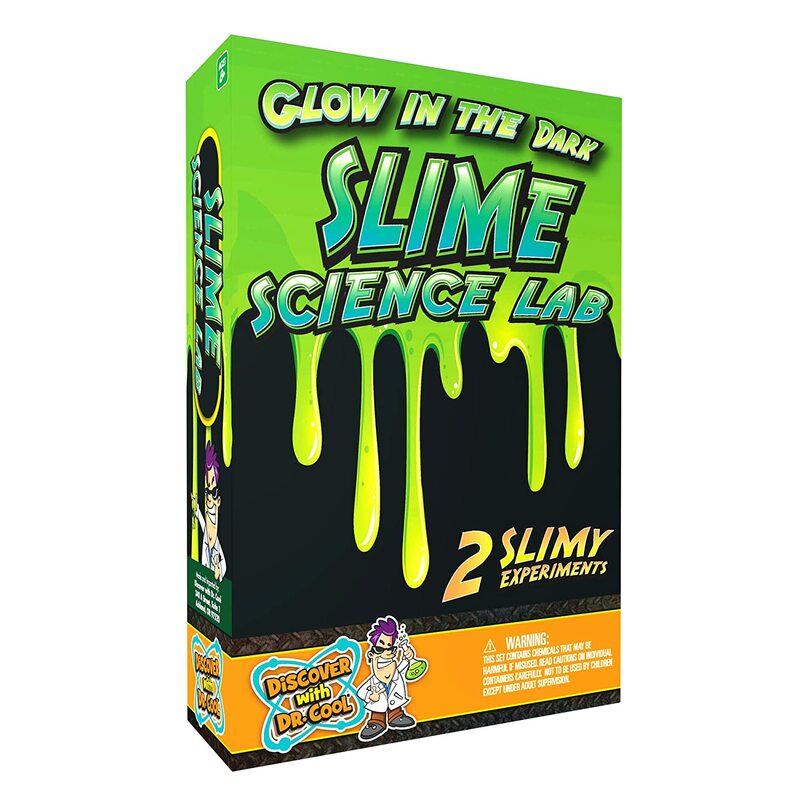 With it, your little terrors will learn how to make glow in the dark slime! Kids can follow the instructions themselves, although some parental supervision is probably a good idea. This also comes with a 12 page learning guide that teaches your kids about the science and physical properties of slime, so its got an educational side too. Just make sure to tell your kids to keep the slime in their own room. 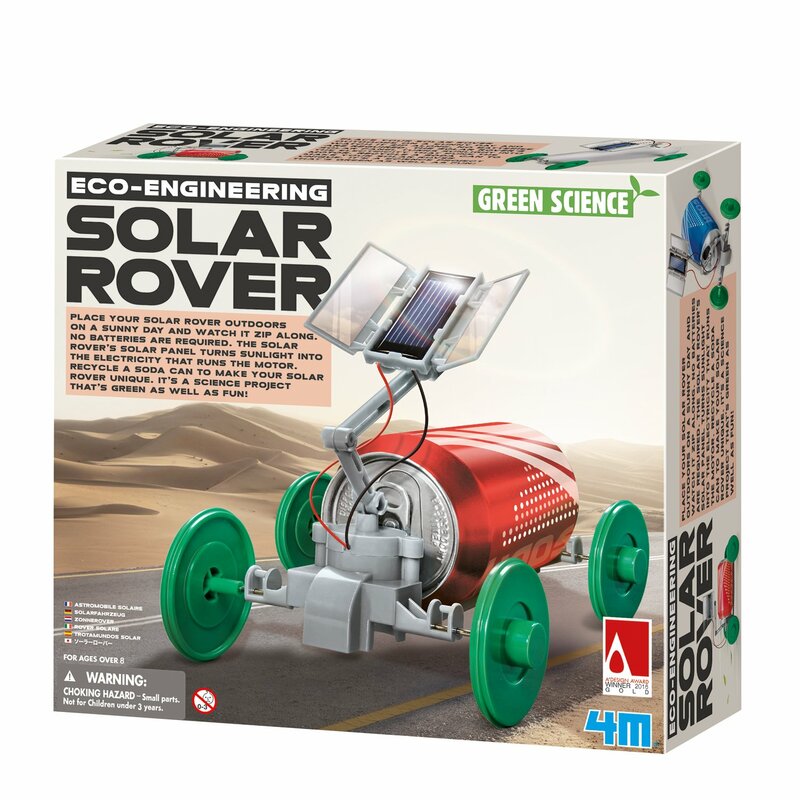 The Solar Rover could be a great gift for boys of ten years old, as its a good age for them to learn about clean and renewable energy, recycling and solar power. Turn an old soda can into a working solar powered car with this amazing set! This will be a perfect present for an inquisitive young man who is interested in science, engineering and cars. 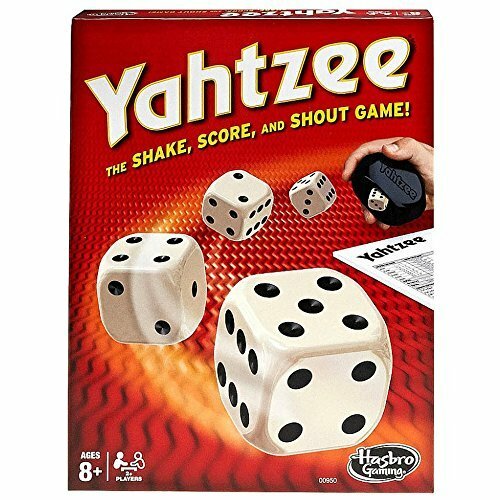 Kids around 10 will think this is perfect, so it is time to pick up the classic kids game of Yahtze. If you’ve never played it before (you must have been living under a rock or something), its a fairly simple game where you roll dice and try to get the winning combinations to beat the competition, so not only is it amazing fun, but it also helps with their math and counting skills. Every household shout has a Yahtze game in a cupboard somewhere, and your boy will love playing this with his friends. It is also a great game to play with mom and dad. IF your kids are anything like mine, watching so many Japanese cartoon has made them really fall in love with Japan. So if yours are anything like mine, this cool board game might be a great gift for them. Tokaido is a really fun and engaging game, with some amazing art work on its pieces, board and cards. In it, each player chooses a character that must successfully cross the ‘East Sea Road’ in Japan. Along the way players will meet people, taste fine meals, collect beautiful items, discover great panoramas and visit temples and wild places. At the end of the game, the winner is the one who met the most interesting people and saw the most places. 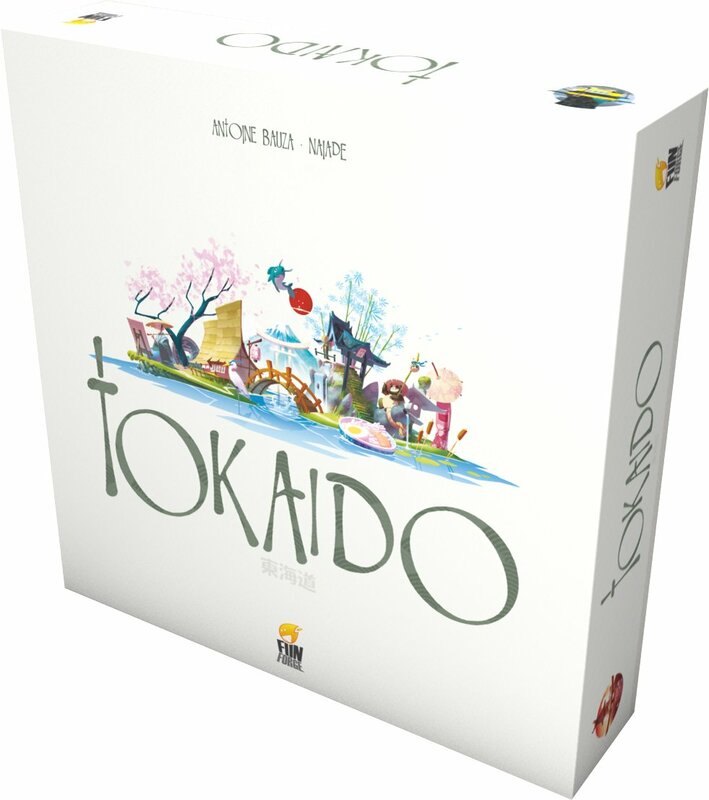 Tokaido is wonderful because it strikes a great balance of being easy to play yet having a lot of strategic opens and being difficult to master. It’s also nice to see a board game that isn’t about armies or soldiers for once. 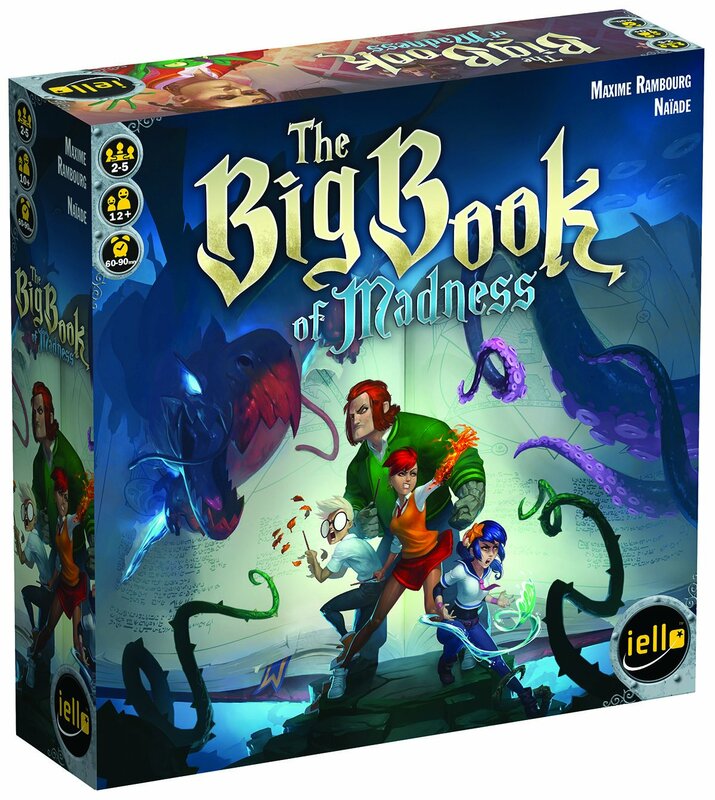 Someone made the mistake of opening the big book of madness, letting out all the monsters trapped inside. It’s up to your son and his friends to use their magical spells to make everything right again. This fantastical board game will be ideal pick for boys who love fantasy, wizards, and books like Harry Potter. In this deck game, 2-6 players must play competitively to banish the demons on all 6 pages of the titular book. They can do so by building up their decks of spells and elements, but they also have to contend with curses and insanity at the same time. This is a wonderful board game that combines card playing with awesome fantasy, and it is a good cooperative challenge for your son and his friends to work through.